The Canon Pixma MX925 all in one multifunction printer delivers high productivity with timesaving features, wireless capabilities, and extra capacity inks. It supports Wi-Fi and ethernet connectivity, enabling you to print, scan, copy and fax from virtually anywhere in the office or at home. The device supports Apple’s AirPrint and Google Cloud Print. The printer also supports Canon's Pixma Printing Solutions app to send the printer documents from an iOS or Android mobile phone or tablet on the same network. The printer features 5 single colour Canon Pixma MX925 ink cartridges, so that you only need to change the colour that runs out, making printing more efficient. The printer comes with a glossy black exterior weighing 11.7 kg approx. and measuring 231 x 296 x 491 mm respectively. At the top of the printer, there is a fold over paper support for the 35 sheets ADF, allowing you to scan and copy double-sided documents and it also has integrated duplexer in the scanner. It has a large 7.5cm colour TFT display along with four mode buttons for Scan, Copy, Fax and Menu. It also has a 16- button dual function pad that lights up when their respective functions are selected. The device also has a flatbed scanner adjacent to the small dual function operator panel with a three-inch colour display. The front cover of the device folds down to make an output tray and there is an inner cover which folds down, allowing to print onto CDs and DVD disks. The main paper tray can store up to 250 sheets of paper and there is also a secondary tray which can hold up to 20 photo sheets. The printing speed of this printer is up to 15 ppm for monochrome files and 10 ppm for colour files. The Canon Pixma MX925 also supports high-speed USB type B and a USB flash memory port. 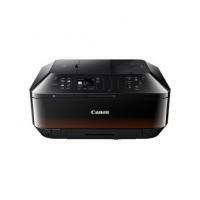 The multifunction Canon Pixma MX925 can print, scan, copy and fax and print directly to CD/DVD media. It has full wireless print support and can copy, as well as print, duplex pages. It performs well for a printer in this price range and provides a wide range of useful features that will appeal to both home users and small businesses. However, its limited paper storage capacity cannot handle large print jobs and lack of telephony features in fax machine might not make it a perfect choice for large working groups. How to align the printheads? The Canon Pixma MX925 is an all-in-one printer that is ideal for not only offices but for home users too. Along with the printer is shipped the Canon Pixma MX925 ink cartridges, drivers and some necessary software. The printer is easy to operate and can be setup without difficulty. While setting up, there are many processes that are required like installing the Canon Pixma MX925 ink cartridges, loading paper, installing the PrintHeads etc. One of the processes is aligning the printheads. This needs to be done to ensure a good print quality and a better working of your printer. Open the paper support and pull it upwards. Tilt it a little back. You will notice 1 paper guideline knob on each side of this support. Move both of these to extreme edges. Load a sheet of speciality paper such as Matte Photo Paper in the rear tray of the printer. Make sure you have loaded the correct side of the paper. Whenever you are aligning the print head then use the Matte Photo Paper MP-101. Now slide the paper guides till the edges of the paper such that the guides touch the paper’s edges. Open the front paper output tray and the output tray extension to catch the printer paper. Once you have done that, press the Ok button. Doing so will begin the process of print head alignment. The process will take about 4 minutes to complete. The printer will print out a pattern on the paper. Take the paper out. The alignment of the print head at the machine setup will give a correct pattern print. If there are any discrepancies in the pattern the ink cartridges are not right. Always use the premium quality Canon Pixma MX925 ink cartridges for a better quality printing. A message will appear on the screen. Load a new paper and press ok. The alignment process is complete. Q. What do you mean by chipped ink cartridges? A. Chipped ink cartridges enable the printer to read the ink levels in the cartridge and to ensure that cartridges produced by other manufacturers could also be used with the printer. Canon Pixma MX925 ink cartridges are chipped to maximise convenience for the user. Q. What types of paper can I use with Canon Pixma MX925 printers? A. You can use plain paper, envelopes, photo paper, glossy photo paper, luster photo paper, semi-gloss photo paper, matte photo paper, high resolution paper, photo stickers with this printer to print on. Q. I have spare ink cartridges from my old Canon Pixma MG5450 printer. I was wondering whether I could use these spare ink cartridges with the Canon Pixma MX925 printer? A. Yes, you can use the spare cartridges from your old printer with the MX925 printer as Canon Pixma MX925 ink cartridges are the same as those used in Canon Pixma MG5450 printers. Q. What print quality can I expect from Canon Pixma MX925 printers? A. Canon Pixma MX925 printers produce high-quality printouts. They can print up to a resolution of 9,600 x 2,400 dpi making it perfect for users who require high-quality prints. Q. What devices can I use with this printer to print from? A. You can use computers (Windows and Mac), Apple, Windows and Android devices, USB flash memory drives and PictBridge enabled cameras with Canon Pixma MX925 printers to print from. Q. What do I do if a faulty Canon Pixma MX925 ink cartridge is delivered to me? A. In the event that a faulty product is delivered to you, please contact us on 048 308332211 or email us on info@printerinkcartridges.ie regarding the issue within 30 days of receiving the product. Just have your order details and invoice number ready and we will guide you through the process for replacement. Q. What precautions should I keep, while handling the print heads/ink tanks and Canon Pixma MX925 ink cartridges for the first time? A. While handling the cartridges, firstly make sure to keep the ink tanks out of the reach of children. In case ink is accidentally licked or swallowed, rinse your mouth immediately or drink one to two glasses of water. If the irritation or discomfort occurs, obtain medical advice immediately. Do not attempt to disassemble or modify the print head, ink tanks, or cartridges. Q. I am not getting satisfactory print results while printing through Canon Pixma MX925 printer. A. If the print results are not adequate, the paper used for printing could be an issue. We always recommend you to use good quality paper for printing. Also, using expired Canon Pixma MX925 ink cartridges could result in such prints. Replace the cartridges, once you have the new ones available. Q. How to clean the exterior area of the machine? A. While cleaning the printer from external side make sure to use a soft and dry cloth such as eyeglasses cleaning cloth to wipe off all the dirt present on the surface. Be sure to turn off the power and unplug the power cord from the machine to avoid any damage. Avoid using tissue paper, paper towels, rough-textured cloth or similar materials for cleaning as it may leave scratches on the surface of the printer. Some volatile liquids or chemicals might harm the machine to use only good quality cleaners for your printer. Q. Can I use the other functions on my Canon Pixma MX925 printer even when the Out of Ink error message is being displayed on the screen? Or do I first have to replace the Canon Pixma MX925 ink cartridges before I can use the printer? A. You can use the other functions of the printer like scanning even if the printer is displaying the Out of Ink message. You will have to clear the error message by pressing and holding the Resume/Cancel button on the printer for about 5 seconds. Once the error message has been removed, you can use the printer for other functions. You should remember not to print until the Canon Pixma MX925 ink cartridges have been replaced. If you print then the print quality will be bad. Once the error message clears off, you should not attempt to print. You should also replace the ink cartridges as soon as possible because leaving the old Canon Pixma MX925 ink cartridges in the printer will allow the ink to dry in the print head nozzles and this may clog the nozzles. Q. What is a WPS and how can I use it for Canon Pixma MX925 printer? A. WPS is short for WiFi Protected Setup. This helps in creating a wireless connection between your wireless router and printer. When you press the connectivity buttons on the router and printer together, this connection is established. This allows you to print wirelessly. Q. I am unable to use my Canon Pixma MX925 printer. It is unresponsive. Can you help? A. The printer becomes unresponsive due to many reasons. You have to check if the printer is turned on. You may have placed the printer far from the router. Once the printer is placed near the router you will be able to print easily. Also check that you have marked the printer as the default printer for your system. Check your computer and see if it is connected to a power supply. Try reinstalling the printer driver. Reinstallation of the printer driver will override any previous settings. Q. In what frequency does the ink absorber tank needs to be changed? A. The ink absorber tank is a unit that collects excess ink that cannot be used for printing. The ink that is used from the Canon Pixma MX925 ink cartridges for head cleaning cycle is stored in this tank after the cycles. The ink absorber needs to be replaced only when the one that is in the printer is full. Your printer will give you a warning message about it. But you must be careful not to tilt the printer when this ink absorber is full, this will make the ink leak from the absorber. The ink absorber can only be changed by trained professionals. Q. My Canon Pixma MX925 printer is not printing at all. There is no Out of Ink message on the screen but the printouts are blank. How can I correct this problem? Does this require replacement of the Canon Pixma MX925 ink cartridges in the printer? A. This problem is not caused by low ink in the Canon Pixma MX925 ink cartridges. The cause of this problem is blocked print head nozzles. If you leave your printer unused for a long time, the ink in the print head nozzles dries up. This clogs the nozzles and blocks the ink from flowing from the cartridges to the print heads. So even if you send a print command and the printer prints, there will be no ink on the paper. You will have to run a few cleaning cycles of the print heads. Doing so will correct the issue and you will be able to print.